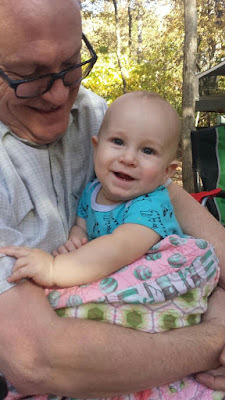 My Charmed Cabin Life: David to the Rescue! I wanted to tell you a story of a man named David Hurd...He's a grandpa...loves his family...and has been quilting since 2009. He's a long arm quilter who lives up north near Saint Joseph, Missouri. If you want to read his story directly from him, visit his website! I contacted David in a hurry a few weeks back concerned that I wasn't going to be able to finish my 5 year old's quilt in time after she stated she wanted to enter a quilt show like her Nana...This was some serious pressure. 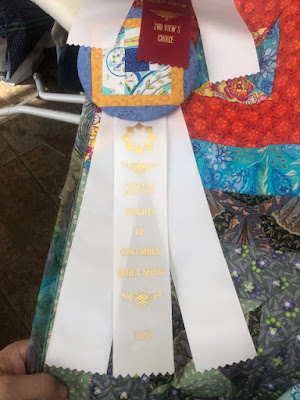 I could not have been responsible for not winning due to any errors I would make on her quilt so I called for help. David answered that call. Repeatedly...Every time I had a question via email, I got a response within minutes. Every time I called...he answered. I had a short time frame....Very short. I went to measure the backing that J had picked out previously and it wasn't long enough in any direction. How on earth did I let this happen? I had to look for another backing. When I finally found one that would answer all of the problems with her unique quilt size...I had less than a week to have it ready for turning into the show. I called David (again) on Thursday and asked if it was even possible to ship it to him and have him ship it back in time. I told him I would overnight it...He said he was about to have a quilt come off his machine and it would be perfect timing to put J's on. He was so nice! David had the quilt top before noon on Friday...even texted me a picture to confirm the thread color...Purple, of course! But there are lots of purples in the world. Oh the decisions that a 5 year old must make! David had the quilt quilted, binding complete, and shipped back by the end of Friday. Can we say, miracle worker? Now, I'm not gonna lie...anytime someone rushes work, I get worried about quality. However, I have been stalking, I mean watching, David on his Instagram page and his work is amazing! 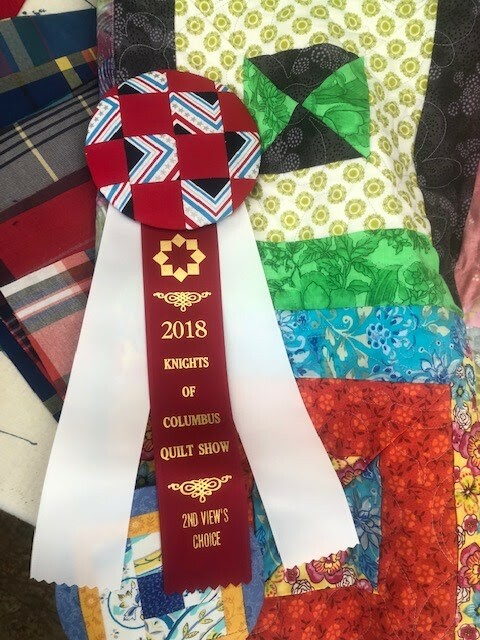 So I was more excited about how awesome the quilt looked than if he made an error (which he did NOT!). Do you remember this? I may have posted this quilt top once or twice before. This was the picture I took when Jameson and I had a sewing day in our pajamas. It was awesome. I highly recommend you do this at least once in your life - sew in your pajamas! This is the quilt top as Jameson had finished last summer (2017). She didn't know what she wanted for the backing of the quilt, so it took a while for a five year old to decide that. I did help her with some possibilities that would match because that's what she wanted. Hey, I'm not turning down a reason to go to a quilt shop...I'm not crazy! I got the package on Monday in our regular mail...and it was such a small box compared to what I sent him. I was surprised he compressed it so tightly in the box to make it fit. Hubby and I opened it together and our jaws just dropped. The best part? Making this dream come true for a 5 year old, didn't cost me an arm and a leg...David charges $0.015 per square inch of quilting...I purchased the batting through him as well...and his wife cut, made, and then did all of the binding for me! All I had to do was send the fabric. My total...$112.65. 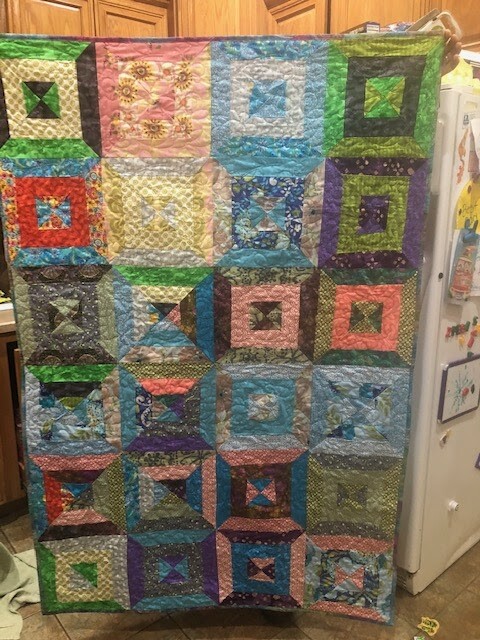 I have more in the fabric of this quilt! I believe this was a deal for the quality of work he produced and how gorgeous it really is. If you have any doubts, check out his page as well (remember the link above?) Stalk him, I mean, follow him on Instagram....You will see his gorgeous work. After working this one time with David, I had to share his great work and had to tell you all that I personally recommend him. I will be using David much more in the future...in fact, I have a few client quilts that will be finished soon and I believe that I will use him to quilt them...and perhaps his wife doesn't mind binding them. Thank you David Hurd! You are a life saver and you made this momma and a 5 year old so very, very happy! 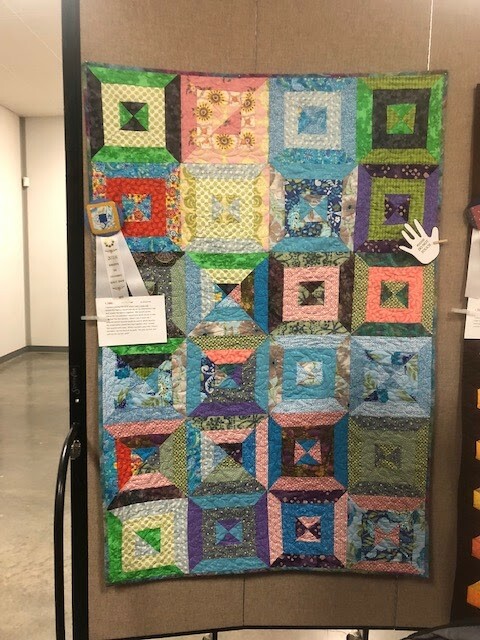 You did an excellent job and I can't commend you enough for making this quilt such a success! And one final thought if you are still on the fence....She won her division (youth)...AND 2nd place in Viewer's Choice overall! That's right...two ribbons! The quilting stitch pattern is flowers with bees throughout the quilt. David has it called "Bee Happy" on his website. Jameson picked this design herself and I helped her name it "Bee Squared". Have you met my friend Tana?